Hi!!! Another week gone. Honestly, the days just pass WAY too fast. AP season is in full swing- one down, 4 more to go. I could rant for days about the futility of standardized testing, but let’s not dampen the mood. Onto the celebration! 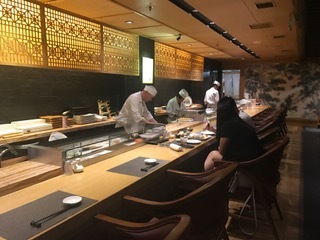 Tsukiji Aosora Sandaime is one of the most well respected restaurants in the heart of the renowned Tsukiji fish market. Ironically, the fish market is one of only places we didn’t go to in Tokyo, so we missed the chance to taste the original. Luckily, the owners transplanted a taste of the Japanese market to Shanghai. All I needed was an excuse to go. Let’s eat! Sashimi- Nothing shows the quality of a Japanese restaurant like the sashimi. Since the restaurant wasn’t any ordinary Japanese joint, I couldn’t order any ordinary sashimi (ie salmon, mackerel…) Hence: Spot prawn, Uni and Hamachi. Literally 5 minutes later, the plate showed up. I didn’t even need to taste the sashimi to know it would be amazing. Hamachi- Hamachi is one of my favorites- lean, with a unique, naturally saltiness. However, it’s incredibly hard to slice. Well, Tsukiji Aosora Sandaime definitely had no problems with slicing. Beyond that, it was amazingly fresh and the addition of the pink salt block really added another depth of flavor. Uni (sea urchin) – This uni was by far the freshest, most delicious uni I’ve ever had. Just looking at it, the vibrant orange was miles away from the borderline grey pieces offered at most other places. The nori wrap added an extra touch of salty umami to the incredible sweet creaminess. Jumbo Sweet shrimp- Sweet shrimp is one of the “safer” orders, but comparing this shrimp to the ones I’ve had in the past is like comparing a Toyota sedan to a Ferrari. That one piece cost 50rmb, but I would literally have forked over double. 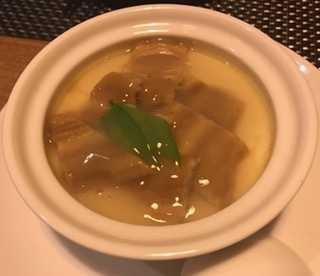 Eel Steamed Egg- For some reason, I’m still craving eel. Normally, e grilled eel is the way to go, but since the sushi already had grilled eel, I decided to switch things up- eel steamed egg. By the time it arrived, my expectations were sky high. Some how, this dish managed to exceed them. 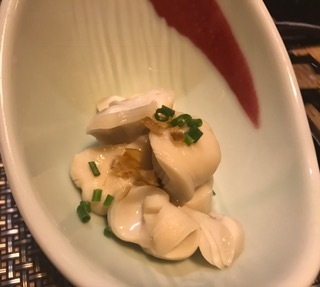 The egg itself was unbelievably silky and rich, coating my tongue with its subtle seafood umami. The real star, however, were the rich, fresh pieces of eel that practically melted in my mouth. ORDER THIS! 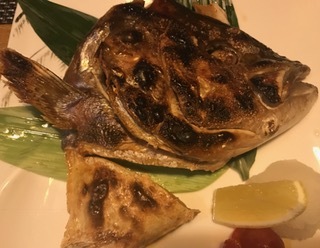 Grilled Amberjack Head- Grilled salmon head is one of my biggest weaknesses, but looking at the menu, I realized there were more options than usual. I really wanted the tuna head; however, apparently, we needed a special reservation, so I went for amberjack. It was my first time having amberjack head, and the bar’s been set into the sky. The head was HUGE, with a generous portion of the fin and neck- the “best parts”. The skin was perfectly charred but the meat remained tender and literally juicy. I couldn’t have asked for more. Bonus, since Amberjack head is a lot less fatty than salmon head, I didn’t leave with a massive stomachache! Note: The restaurant really takes freshness seriously. They import fish daily and seasonally, which really ensures quality. While it is quite expensive, it is quite reasonably priced considering the quality and taste. Service and atmosphere were both as good as the food. 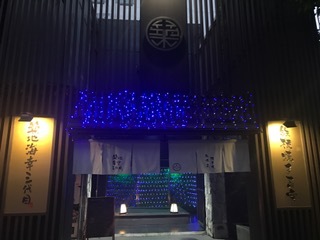 It has the air of an upscale, elegant sake bar. The decour is traditional and minimalist, which really set a calm and sophisticated yet not overly formal atmosphere. 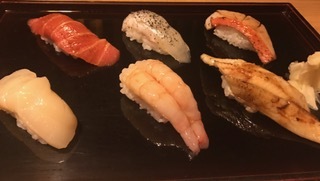 Tsukiji is also perfect for pretty much any occasion imaginable. The first floor features small tables and a sake/sushi bar- perfect for small get togethers, and gatherings. 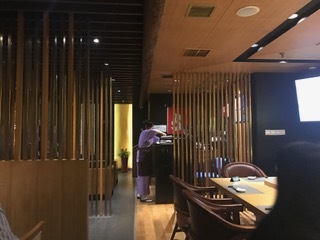 The second floor has tempayaki stations, while the third has private booths for larger parties. My only complaint is that the dim lighting doesn’t really make for good pictures, but who cares! Service was even better. The staff was not only courteous, but actually gave us tips on how to better enjoy the already incredible food. The food also arrived fast. The sashimi literally arrived within 5 minutes. Thee only issue was that they often forgot to refill our tea. Well, that’s it for now. I hope everyone has a happy, delicious and amazing week! For the mom’s out there, Happy Mother’s Day! Check in tomorrow for a very special post! Congratulations! Good Luck for the AP test next week !